​Because I have so much free time on my hands (please note the hint of sarcasm! ), I decided to venture into the business of container gardening this year. Back in late April/early May I ordered all of my supplies. Sometime in mid-May, I planted the seeds in little pods and waited patiently for them to sprout. They did, rather quickly in fact, and I continued to watch them grow and grow until they were finally ready to transplant into a larger container garden. I watered, watched and waited. Each day the sprouts grew more and more. There were lots of green leaves sprouting in both containers. Because I planted the seeds in pods and not soil, I did not mark any of the seeds I planted. So everyday I stared at the leaves trying my best to figure out what it was that was growing. I studied the leaves and I googled images of leaves trying to figure out what to expect. 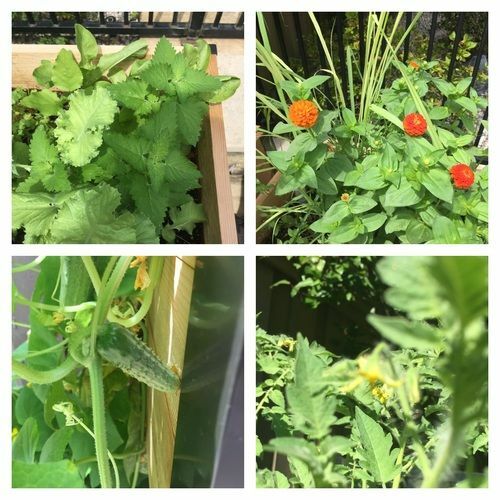 I continued to water, watch and wait until one day, I saw a small cucumber (looked like a little sweet gherkin actually) growing between the cucumber vine and the flower. I got a little giddy and told the children to come and see (it’s the small things in life, folks!). Every morning, I checked the cucumber plant to check on the progress. Each day it grew bigger and bigger and I noticed a couple more forming as well. I continued to check the other plants to see if there was anything growing forth from them, but not quite yet. 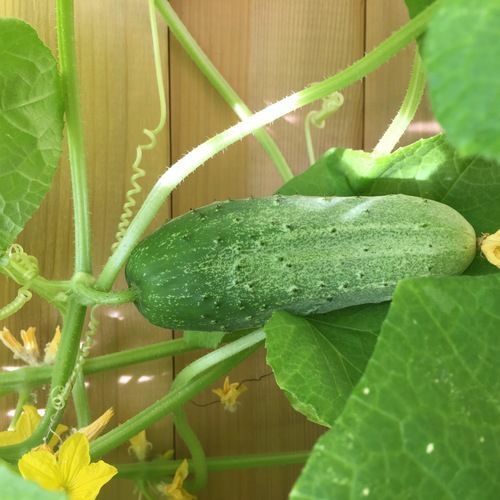 ​Finally, a few days ago, my daughter and I were able to eat that cucumber…the “first fruit” of our summer garden. 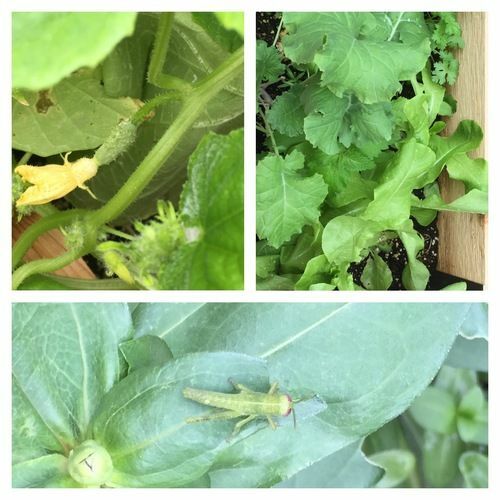 It was delicious and I think we enjoyed it even more because it came from something we planted and nurtured. We have some more that are starting to get big and my son wants to try the next one. We also have some flowers sprouting on the tomato plants so we are anxiously awaiting little tomatoes to sprout any day. Did you know there is a Gardener who also loves “first fruits?” Throughout OT Scripture, the Israelites were told to bring their “first fruits” as an offering to God. The first fruit of the harvest generally was the best because it did not have time to sit in the field and spoil. It usually tasted and looked better as well. They were told to give away their best to God over and over again. In the NT, Jesus was called the “first fruit” because He was the first to be raised from the dead (1 Corinthians 15:20). Jesus said in John 15:1 that He was the vine, but God was the true Gardener. We are connected to the vine through our belief in Jesus (2 Thessalonians 2:13). We should still desire to give our best, our “first fruits” to God, but what about the fruit in our lives? Do you wait giddily to see the “fruit” taking root, sprouting and producing in your life? Are you seeing any fruit? I know some of you are tending your soil, you are watering and yet, you are still getting up each day looking for the “first fruits” of your labor. The Bible tells us to “not grow weary of doing good, for in due season we will reap, if we do not give up” (Galatians 6:9). You cannot give up. I planted a ton of different vegetable seeds and I still have only seen the fruit of the cucumber. I do not know if anything else will produce anything, yet I get up every morning and check the garden. I prune away the dead leaves and I check the water level…I even check to make sure the critters and wrong insects are staying far away. After that, it is completely out of my control if anything bears fruit or not. I am a “gardener,” but I am not the Gardener. God desires that every Christian bear much fruit. Bearing fruit is as simple as staying attached to the vine (Jesus) – that’s it (see John 15:2-8). As we stay connected to the vine, He will lead us to produce the fruit that brings glory to God (John 15:8). If God knew that “first fruits” were impossible for us, He would have never asked for them. He is the one who causes the fruit to produce, but He needs the vine (Jesus) and the branches. The branches are where the fruit appears. God is the base, Jesus is the vine and we are the branches. We need Him and He chooses to use us (John 15:16). Don’t give up on bearing fruit for the Kingdom. We should, in His timing, bear new "first fruits" again and again. There is much work to be done, but He is there to support you always. ​“To everything there is a season, A time for every purpose under heaven: A time to be born, And a time to die; A time to plant; And a time to pluck what is planted” (Ecclesiastes 3:1-2). Love this, Erin! Keep writing!